The other day, as Dan was chopping wood for our wood-burning fireplace, our main source of heat for the house (there are baseboard heaters, too, but those are expensive and less efficient to run), he sliced the above log neatly in two to discover it wasn’t empty. 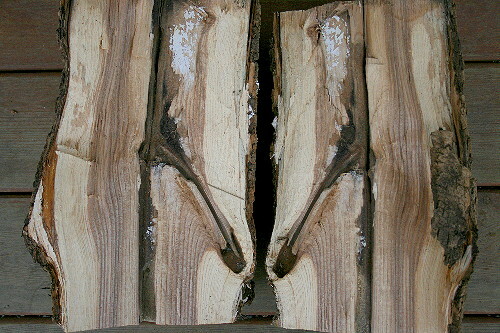 The log cracked squarely down the centre, revealing a long channel down the middle with a secondary tunnel coming off one side, connected to a small chamber. And in this chamber were a bunch of carpenter ants. Unfortunately, I wasn’t home when he discovered the ants, and they were gone by the time I returned, but he kindly set the log aside for me knowing that I’d want photos. You can’t tell from the photo, but the surfaces of the tunnels were worn smooth from thousands of tiny little feet. The logs Dan was chopping were ones that had been sitting in a stack on the property for perhaps a couple years, trees that had been cut down when the landlord thinned the forest to improve the view of the lake. Despite that the house is heated by wood stove, for whatever reason he’d never gotten around to cutting and hauling the logs back to the house. Free wood is free wood, however, and Dan, being the industrious person he is, set about turning it into half a cord of firewood. I rarely find other organisms in my firewood, and when I do it’s usually either fungus, or the engravings of wood-boring beetle larvae underneath the bark. It’s hard to say if the carpenter ants made their home in this log while the tree was still standing and just never moved out, or moved in after it was cut down. While walking the woods today I discovered a tall, dead snag, riddled with holes. The large holes, some bigger than the palm of my hand, were the work of a Pileated Woodpecker. Pileateds drill trees looking for insects that hide inside. Wood-boring beetle grubs are good, but they’re especially fond of carpenter ant colonies, perhaps because once they discover a colony there’s a bonanza of food inside. They drill rectangular holes into the trunk, characteristic in shape and size. Dan watched one woodpecker in our front yard as it started a new hole by drilling in a straight, horizontal line to pierce the bark, and then vertically at either end of the horizontal line. Then it wedged its bill under the slab of bark, and pried it off. This technique of opening up a trunk for excavation explains why they usually have rectangular holes. 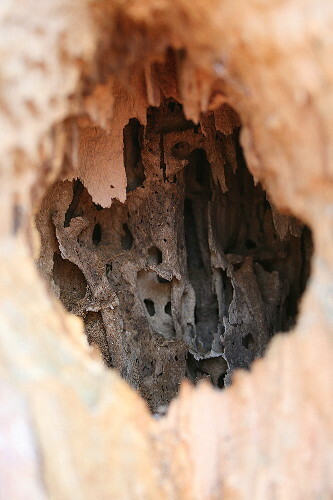 Carpenter ants live inside the trunks of dead trees (or house frames), where they excavate expansive galleries in the wood (you can see the tunnels and entry holes to other parts of the gallery in the photos here). Contrary to popular belief, they don’t actually eat the wood, but simply chew tunnels into it. The sawdust produced from “digging” the tunnels can usually be found at the bottom of the cavity, or at the foot of the tree. 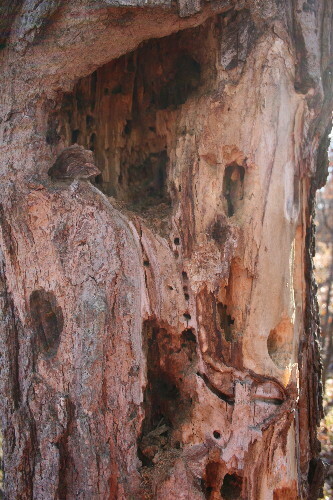 This network of tunnels and chambers forms their home, where the colony lives in a similar fashion to a wasp’s nest or bee’s hive. The size of the network can vary with the size of the colony; some colonies can contain as many as 10,000 or more workers. Carpenter ants prefer to build their nests in moist or damp wood, as it’s easier to chew apart. The wood in homes that runs the greatest risk of invasion are the old pillars or other exterior pieces that are exposed to the elements or some other regular source of water, and therefore prone to rotting. Carpenter ants are generally omnivorous scavengers, feeding on dead insects and many other plant and animal sources of food (although, unlike termites, they are unable to handle cellulose, a structural compound in plant material). A few species will sometimes “tend” aphids, collecting the honeydew that the aphid produces and offering protection to the aphid in exchange. Interestingly, the ants don’t get all the amino acids they need from their diet alone, and so in their gut all carpenter ants carry a bacteria in the genus Blochmannia. The bacteria absorbs some of the nutrients the ants ingest, and in turn produce essential amino acids and other nutrients. Neither one can live without the other, an arrangement called obligate endosymbiosis (“endo” meaning internal or inside, and symbiosis being the name for any arrangement between two species). There are over 1,000 species of carpenter ant in the world, in the genus Camponotus. The most common species here in the east is C. pennsylvanicus, the Black Carpenter Ant. They forage mostly at night, though are still often seen during the daytime. Reproductive individuals are produced by the colony in spring, usually May or June, in large swarms similar to what I observed with the citronella ants. Both sexes have wings, with the new queens being larger. The worker caste has two sizes of workers – “majors” that have huge heads and mandibles, and “minors” that are smaller. The majors are capable of giving a sharp bite, made more painful by the injection of formic acid into the wound. This same formic acid is often put to use by birds by picking the ants up in their bill and crushing them, then running them through their feathers (or by squatting on an anthill and allowing the ants to bite their feathers). The purpose of this behaviour, called “anting”, is often disputed, but is sometimes regarded as being a form of parasite control (such as feather mites, which can potentially destroy feathers). Julie Zickefoose recently did a post on a Black-throated Green Warbler anting in her yard. Bizarrely, I don’t have any photos of carpenter ants themselves, despite how common they are. It’s one of those funny situations, you take lots and lots of photos of all the rare and unusual things you encounter, but never think to take a photo of the common stuff. You just wait, the word “endosymbiotic” will appear on yogurt containers as a key marketing tool. I’ve found the same thing: and have had to adjust my photographic tendencies accordingly. But in my case its more about water, and its common manifestations, and not wildlife. BTW, I head a pileated woodpecker today in Maryland (visiting), but did not see it. Birds are like that, especially those. The extraordinary can be found in the ordinary.